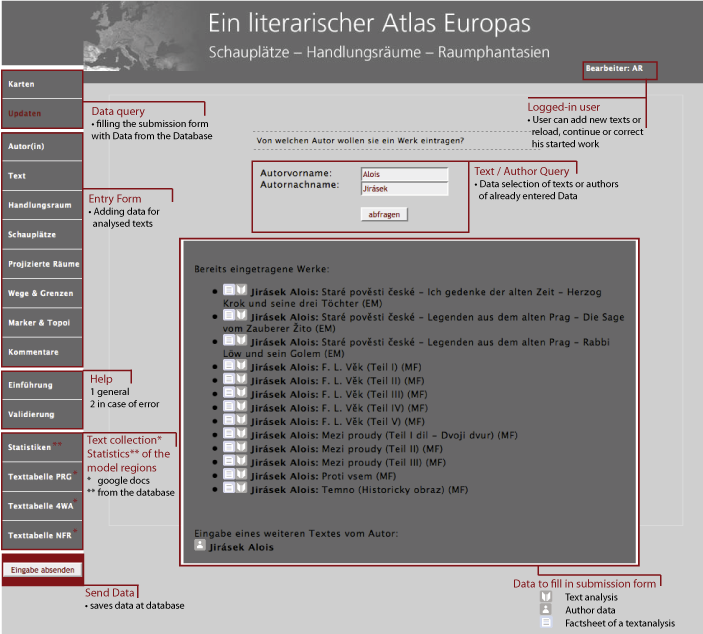 To enable extensive data acquisition, an online data submission form was developed, specially tailored to the needs of literary scholars. This submission form is connected directly to the database and controls the data reading and recording process of the scholars intto the specific data model. It is designed to allow intermediate storage, data modification and manages redundant entries. For instance, a new text from an already entered author is added without re-entering those bibliographic references, by assigning the fiction to the existing author record. Furthermore, the submission form provides scholars with an overview through ‘action – reaction’ buttons: particular entry fields only appear when a specific button is pressed. To ensure an error-free entry, fields expecting numbers are marked and tested before sending it to the database. Similar precautions have been made at coordinate fields – the coordinates are directly constructed through the geocoding tool. All data entered into the form are automatically evaluated and transferred into the database.